I decided to to a little altering of the Double Pocket Pouch directions found here, and made it smaller to fit 3"x3" cards and envies. Score at 2 ¾” and 6 1/4"
Score at 3 ½”, 3 ¾” and 3 ¼"
Use the horizontal punch to make holes in the top of your bag to thread your ribbons through. Once the ribbon in threaded – secure with brads. Oh Lisa! Thanks so much for sharing this! I love it! Made the bigger bag but this would be perfect for a hostess gift. I have a SAS at a teachers house next week and this will be awesome to give her! I will try and work on it today or tomorrow and let ya know when I'm done! Lisa this is Absolutely Gorgeous! Love the paper you used!! I am having lunch with two very dear friends and will need to make 2 of them! Thanks so much for sharing this with us!! Oh, what a good idea! I wanted to make a set of these for my nieces for Christmas!! Awesome job! 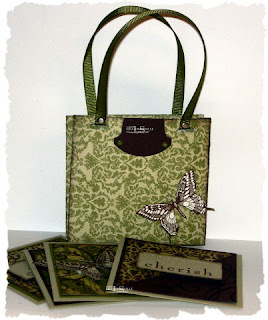 Love that you made the double bag into a container for 3x3 cards! Wow, this is adorable, can't wait to give this a try. Thanks for the directions!!! I can't wait to try it out. Thanks for figuring out smaller dimensions. Your bag is just wonderful. Very creative. This turned out so beautiful! TFS! OK! I finally got this done today!!! It was VERY easy to follow...thanks for sharing your instructions! I've posted mine on my blog.